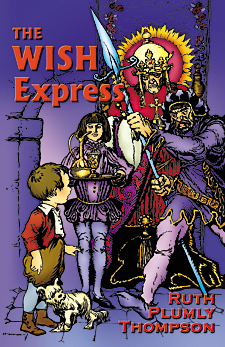 "Marvelous Travels on a Wish, Part 3"
Author of The Yellow Knight of Oz, "The Wizard of Pumperdink", "King, King! Double King! ", etc. Originally published in the Philadelphia Public Ledger, August 6 and 13, 1916. Berens, a little boy who is tired of his home, wishes himself Somewhere Else. He and his little dog, Rags, are bitten by the Dissatisfied Bug, who whirls them through the clouds and aboard a wish, which is somewhat like a trolley car. The wish is full of dissatisfied folks, also bound for Somewhere Else. There are an elephant, a donkey, a farmer's boy, a horse, a little old lady, a little old gentleman, a red-headed little girl, a serving maid and a poet on board. Just as Berens had managed to get a seat a terrible-looking creature came to collect the fares. It was Envy, the conductor of the wish, and each passenger stole something from his neighbor to pay Envy his fare. Stuffing the articles into his hat, Envy retires, announcing that the next station will be TALKTOWN. As the wish rushes on its way Berens and Sarah Ann, the little red-headed girl, become great friends. Sarah Ann explains that she is going to be a beautiful little girl without freckles when she arrives Somewhere Else. Talktown is a frightful place. The members of the party have some narrow escapes, and Rags and Berens are buried under a falling house. Here they meet the "I'm a goin' tos" - who are always "going to do" great things. Aboard the wish once more, the passengers all tell what they are going to be when they reach "Somewhere Else." "Sic him, Rags," whispered Berens, and Rags bounded over and nipped the elephant sharply on the ear. The elephant sleepily opened one eye. "Are you going Somewhere Else?" asked Berens languidly. "It seems to be the thing to do since he's (waving his trunk in the donkey's direction) been running things." "What are you going to be when you get Somewhere Else?" asked Sarah Ann curiously. "Same thing," said the elephant with a yawn. "Can't think of anything better, can you?" "Well, no," replied Sarah Ann thoughtfully. "But what's the use of going Somewhere Else if you're going to be the same thing?" "Well, I've decided to discover something new," said the elephant impressively. "Something terribly new, a platform or a tribe or something like that, you know. And one must always go Somewhere Else to discover - " Here the voice of the elephant became very indistinct and the rest of his sentence was swallowed in another terrible yawn. "He's asleep again," exclaimed Berens in disgust. "What do you suppose the donkey's doing?" whispered Sarah Ann suddenly. Berens looked across and saw the donkey leaning far out of the wish window, his ears flapping briskly in the breeze. Without turning around, the donkey twitched his ears and remarked in a low tone, "Watching." "What for?" said Berens, trying to scramble up beside him. "And waiting," continued the donkey in the same low tone. "What for?" asked Sarah Ann, coming hurriedly across the wish. "I object to the question," said the donkey gravely. "Don't you know that if you watch and wait long enough something is bound to happen?" "A watched pot never boils," grumbled the elephant sleepily. "Don't mind him," said the donkey. "Do you care for thistles?" he asked, turning around to gaze at the two children. "Thistles!!!" gasped Berens and Sarah Ann. "What do you take us for?" growled Rags. "Well, thistle do then!" growled the donkey, and continued to stare out of the window. "You're very rude," said Sarah Ann severely. "Oh, by the way," called the donkey, glancing over his shoulder, "I'm going Somewhere Else, too. I'm going to be a Bull Moose." "Now with me," remarked the Horse in a confidential tone to Berens, "it is different. You see it is a matter of pulling. I'm going Somewhere Else so that I can ride a while, instead of pulling other people." "That'll be nice," answered Berens absently. "Why, you never told us what you were going to be when you got Somewhere Else," burst out Sarah Ann. "That's so," said the Horse, putting his ears forward curiously. "What are you going to be? What are you going to be?" shouted the Serving Maid, the Poet, the Little Old Gentleman - all of them, in fact, except the Elephant, who was asleep, and the Donkey, who was watching and waiting. "Why, I - " began Berens. But here the Dissatisfied Bug banged open the door at one end of the wish and Envy the door at the other. Both rushed in, collided violently in the centre, and fell in a tangled heap to the floor. At the same moment the wish stopped with a jolt. The Dissatisfied Bug was the first to recover. Gravely it separated its arms from its legs. "State of Discontentment, State of Discontentment!!!" it bawled loudly, and then politely helped N. V. to its claws, and arm in fin they minuetted down the middle of the wish and jumped off together. "Guess we might as well look around a bit," said the Poet, and stepped stiffly after them. "Come on," cried Berens. "Come on." Helter skelter rushed all the passengers from the wish to see what the strange State of Discontentment would be like. With Rags tucked under one arm, Berens looked curiously around him. The wish had come to a stop at the top of a high hill. In the valley below they could see a little brown village; beyond that a great many mountains. "I hope it's not going to be like Talktown," said Berens. "Great shining bones, I hope not," breathed Rags fervently. "It looks kind of boggy to me," he added, wiggling his nose dubiously. "There seem to be a good many mountains," said Berens, shading his eyes. "And people," said Berens. "I wonder what ever is going to happen to us here?" "Nothing," wheezed a disagreeable voice in Berens' ear. "At least, nothing pleasant." "Nothing pleasant ever happens here," continued the Blue Person in a gloomy tone. "Now if I just had - "
"Why," cried Berens, rudely interrupting him, "what in the world have all those people down there got their umbrellas up for? It isn't raining." It certainly was surprising to see hundreds and hundreds of people, with umbrellas up, rushing to and fro in the bright sunlight. "Why, everybody has an umbrella up," added Berens excitedly. "Would you like to borrow one?" asked the Blue Person, rolling his sad eyes at Berens. "But it"s not raining," persisted Berens.
" 'Course it is not raining," grumbled the Blue Person. "Of all stupid people! Don't you know that if we didn't put up our umbrellas we'd see the sun?" The Blue Person looked so fierce as he said this that Berens was afraid to say anything, and hastily took the umbrella that was held out to him. "I shan't put it up, though," he whispered to Rags. The Blue Person in the meanwhile opened his umbrella and sank down upon a rock. "Oh, dear," he groaned loudly. "Oh my!!! Oh, oh, oh!" Each Oh! got louder and louder. Berens looked uneasily at Rags, and Rags looked uneasily at Berens. "Is there anything the matter?" ventured Berens at last. "Everything's the matter," groaned the Blue Person in a hollow voice. "Oh, oh, oh, my! Oh, dear! Oh, my head; oh, my heart!" Berens was so interested in the singular behavior of the Blue Person that he had not noticed a strange-looking party who had come up behind him. Now the creature (I simply must call him a creature) strode forward and laid his hand heavily upon the Blue Person's shoulder. "Things are going to be a great deal worse than they are now, my dear fellow!" he croaked dismally. "Oh! Oh! I knew it!" moaned the Blue Person, mopping his eyes with his handkerchief. "I knew it!!" Then, choking down a sob, he rose unsteadily "I want you to meet my friend, the Glooms," said he to Berens. "Pleased to meet you," muttered Berens awkwardly, which was hardly the truth, for the Glooms was a creature hideous in the extreme, being of a sad-green, bluish-yellowy color and of a terribly lumpish figure. Just as Berens was trying to decide whether it was a man or a thing, the Blue Person sighed heavily, and, taking the Glooms by the arm, went off. Berens could tell by the way the umbrella shook that he was weeping violently. "There goes Sarah Ann!" cried Rags, perking up his ears. "Some one has loaned her an umbrella, too." Sure enough it was Sarah Ann. With the umbrella held stiffly over her head, she was crossing a meadow quite a little distance below. "Yoo-oo, Sarah!!" screamed Berens, dashing down the hill. "Yo-ooo, Sarah!" Bumpppp - a little old man with his umbrella held down over his face had run forcibly into Berens, knocking him head over heels. "Look where you"re going, can't you," growled the little old gentleman irritably. "Look where YOU'RE going," replied Berens hotly, picking up himself and his borrowed umbrella. The little old man carefully stuck his umbrella point in the ground, and, thrusting both hands into his pockets, sternly confronted Berens. "What brought you here?" he demanded at last. "A wish," said Berens, thinking it better to answer at once. Besides , there was something about the old gentleman's nose that was positively fascinating. Between you and me, it was decidedly out of joint. "Oh!" responded the old gentleman, rubbing his queer nose, "then you're only passing through the State of Discontentment? I'm rather glad of that, because - "
"So are we," snapped Rags pertly. "Come on," he growled in an undertone to Berens. "This old party gives me a pain in my tail." " - you might want to put your finger in my pie," finished the old gentleman anxiously. "Have you got a pie?" asked Berens eagerly. "I love pie!!!" "What!!!" cried the old gentleman in alarm, and, snatching his umbrella, he ran off at top speed. "Well, of all the queer people!" said Berens, gazing after him. When he went to look for Sarah Ann, she had disappeared from view. There were any number of blue people running about, jostling and pushing each other disgracefully. Some not only had umbrellas but dark glasses as well. They all were muttering something under their breath. It sounded like this: "If I had a hadda had - if I had a hadda." Suddenly, without knowing why, he began to feel very cross. "I believe Sarah Ann heard me and just pretended she didn't and I believe they all ran away and left me on purpose," said he sulkily to Rags. "Stop!" barked Rags in alarm. "You're turning blue." And, my dears, he really was, you know. "I'll put up my umbrella," he remarked to himself. "This sun hurts my eyes." And straightway he put up his huge umbrella, whereat he looked bluer and felt crosser than ever. Soon he began bumping and jostling every one he met in the rudest manner imaginable. Rags trotted sadly behind, with his tail and ears drooping forlornly. It all comes of divisions," he muttered over and over to himself. By now they had come to the dingy little village. "The houses look just like snuff boxes!" grumbled Berens crossly. Before a particularly snuff-boxy one he paused and looked over the gate. A very blue old lady was rocking to and fro in the front yard, knitting with two terribly fierce-looking needles - knitting and grumbling and rocking, and knitting and grumbling and rocking, and (you keep this up as long as you care to, as the old lady is probably at it yet). "Did a little girl with red hair go past here?" called Berens, after watching her for a while in silence, while Rags put up his ears inquiringly. "Bright red hair?" asked the old lady, without looking up. "Yes," said Berens, "bright red. It is bright, isn't it?" appealing to Rags. "Sure!" said Rags, with his tongue out. Then I didn't see her," said the little old lady triumphantly; "I never see anything bright!" "Oh, dear!" sighed Berens, shifting the umbrella, which had grown uncommonly heavy, to the other hand, "are you sure?" Right in the middle of this rock a shutter in the second story of the snuff box flew open, and a little fat man stuck out his head, for all the world like the bird in a cuckoo clock. "Are you going to the meeting?" he piped shrilly. He did look so comical that Berens laughed in spite of himself, and immediately his umbrella jerked out of his hand and went hopping off down the street. "I'm glad it is gone!" cried Berens. And so am I, my dears, for as soon as the umbrella turned the corner, which it did with a skip and a hop, Berens stopped looking blue and feeling cross. "I say, are you going to the meeting?" shrilled the little man again. "Wait. I"ll come down," he added, pulling the shutter to with a bang before Berens had time to answer. From the racket within, he evidently came down on his head. In a moment he rushed out the front door, pulling his coat on as he came. "You must be a Hadder!" he exclaimed hurriedly. "My dear sir, you simply must!" and linking his arm confidentially through Berens, he started off with him down the street. Berens felt so important at being called "My dear sir" that he made no objections. "Perhaps you are a Hadder?" the little man was saying now. "I don't think so," said Berens cautiously. "But then, I should like to be." "How about the dog?" asked the little man, jerking his head in the direction of Rags. "Oh, he'd like to be one, too!" said Rags quickly. "Well, it's really very simple," explained the little man. "You just keep thinking of the things you might have had - see? For instance, if I hadder had a king for a father I might have been a king, and if I hadder had a lot of money I might have been a millionaire - "
"Oh!" said Berens, "that is easy. Why, if I had have had another chance I might have been the pitcher on the team; if I had - "
"That's it! That's it!" exclaimed the little fellow, clapping Berens enthusiastically upon the shoulder. "You're coming along finely!" "If I hadder had a bone before I left, I wouldn't have been so hungry now," put in Rags sadly. "Here we are!" said the little man suddenly, and stopped before a tall, gloomy building. Over the door hung a dark blue sign, which read "INDEPENDENT ORDER OF HADDERS." Crowds and crowds of blue men and women were putting down their umbrellas and hurrying up the steps. The little man had soon ushered Berens and Rags into the building. It looked quite like any other public hall that you have seen; at least, any hall that is particularly dusty and musty and dim. The three found seats in the front, and Berens waited patiently for the meeting to start. No sooner were the company seated before each one pulled out his handkerchief and began to weep bitterly, rocking to and fro and groaning terribly. This surprised Berens not a little. "You're expected to join in the exercises," said the little man, touching him upon the arm, at the same time thrusting a handkerchief into his hand. So Berens hastily covered his face with the handkerchief, groaning "Oh! oh! oh!" every once in a while - but all the time peeking curiously out of the corner to see just how long this particular exercise would last. Rags had his paw over his eye, and Berens could hear him grumbling "Nonsense! Utter nonsense!" (which was probably true). At last, after the Hadders had wept until their noses were as red as their faces were blue, the young lady next to Berens left her seat and slowly mounted the platform. "If I hadder had curly hair," she moaned quite distinctly, "I'd have married the Prince and lived happily ever afterward. Oh! oh! oh!" "Oh! oh! oh! ",groaned the Hadders in concert. "My hair's curly," said Rags in an undertone to Berens, "but I never found that it did me much good." Now another Hadder had the floor. He held a large piece of canvas in one hand and a paint brush in the other. "If I hadder had lessons in art, this here canvas would have been a m - masterpiece!" he sobbed bitterly. "Oh! oh! oh!" "Oh! oh! oh!" sobbed the audience, wringing its hands. Now a thin, angular woman went up on the platform. Waving a long piece of paper over her head, she cried, "Oh, if I hadder just had a vote I'd have been President! Oh! oh! oh!" So the meeting went on. Berens tried to listen politely to all the Hadder speeches, but the hall was very warm and he soon found himself dozing off between sobs. Rags hadn't even pretended to be interested. "Dry as dog biscuits!" he growled, and promptly went to sleep. If we hadder hadder good chance! That we ain't you can see at a glance! The answers to last week's patriotic flag puzzles were Spain, Holland, Switzerland, Norway and Sweden. The Forgetful Poet sends you a little verse, which, he says, may be completed by two vegetables. The peaches, plums and apples start! More things besides the record break!